Scholars disagree, as they always do, on the exact dates. But for simplicity we will use the span from the 6th to the 16th centuries. 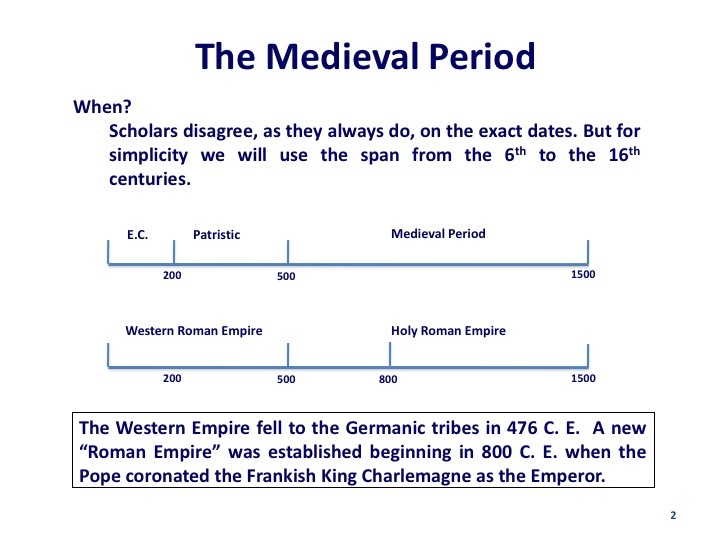 The Western Empire fell to the Germanic tribes in 476 C. E. A new “Roman Empire” was established beginning in 800 C. E. when the Pope coronated the Frankish King Charlemagne as the Emperor. After the Medieval Period ended, subsequent generations imagined, portrayed, and interpreted this period in very different ways. Every century has created its own vision of the Medieval Period . The Medieval Period began the sustained urbanization of western Europe. 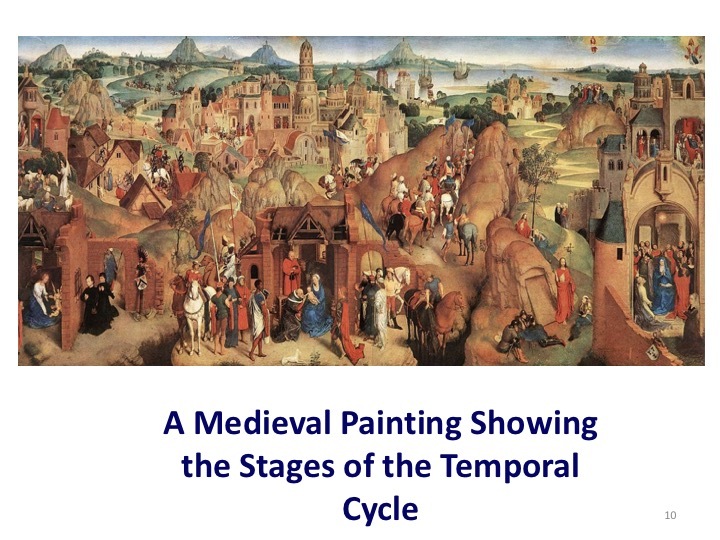 Many modern European countries owe their origins to events and trends in the Medieval Period. With regard to the Holy Roman Empire, it actually existed all the way into the 1800's before it was formally abolished. But it was in a state of decline for many years before that. The philosopher Voltaire, in the 1700's was famously quoted that "The conglomeration that we call the Holy Roman Empire is neither Holy, Roman, nor much of an Empire." We can see on the next slide why he referred to it as a conglomeration. 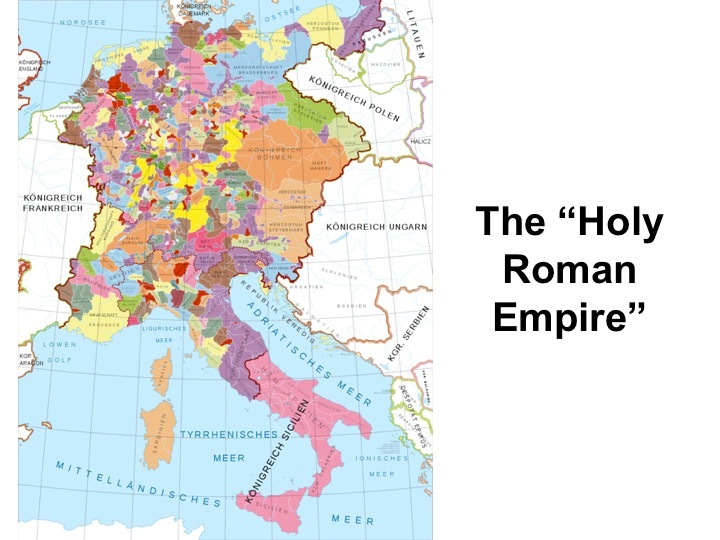 The checkered highly colored map of the Holy Roman Empire was a smorgasbord of over 100 kingdoms, principalities, dukedoms, city states, and other municipalities, all under different leadership. And many of these leaders paid little allegiance to the Holy Roman Emperor. Note also that the boundaries did not encompass all of Europe. There was in fact a period of time in which the title of the Empire was changed to "The Holy Roman Empire of the German Peoples". It later reverted to the previous title. 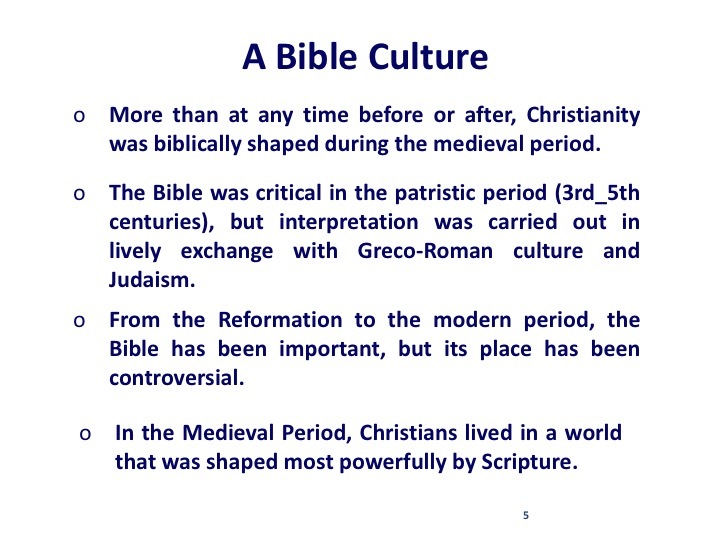 But let's turn our attention now toward the Bible, and the Biblical Medieval Period. We are going to spend mot of the remaining discussion today toward two different aspects of the Bible in this period of history. 1. More so than any other period – life was biblically shaped in the Middle Ages. This was the golden age of the Bible. 2. Bible interpretation in the Middle Ages was very different than how we read the Bible today. We will explore this. Let's begin with the impact the Bible eventually had on the life and cuture of the people in this "Holy Roman Empire" of what came to be called Christendom. More than at any time before or after, Christianity was biblically shaped during the medieval period. The Bible was critical in the patristic period (3rd_5th centuries), but interpretation was carried out in lively exchange with Greco-Roman culture and Judaism. 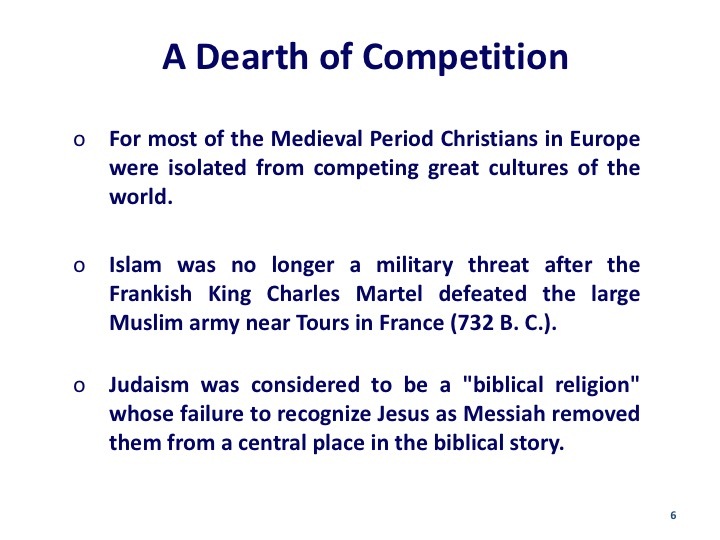 So there was considerable competition from both Judaism and from the remnants of the more popular pagan religions. Then from the Reformation to the modern period, the Bible has been important, but its place has been controversial. In the Medieval Period though, Christians lived in a world that was shaped most powerfully by Scripture. And importantly, for a variety of historical reasons, the Bible had little competition. For most of the Medieval Period Christians in Europe were isolated from competing great cultures of the world. Islam was no longer a military threat after the Frankish King Charles Martel defeated the large Muslim army near Tours in France (732 B. C.). After that defeat the Muslims must have felt they had extended their military adventures too far and too fast and for centuries afterward did not attempt serious campaigns into the western part of the Roman Empire. And to many Judaism was considered to be a "biblical religion" whose failure to recognize Jesus as Messiah removed them from a central place in the biblical story. Before the invention of printing, the experience of the Bible story was less individual and direct than it was communal and indirect. 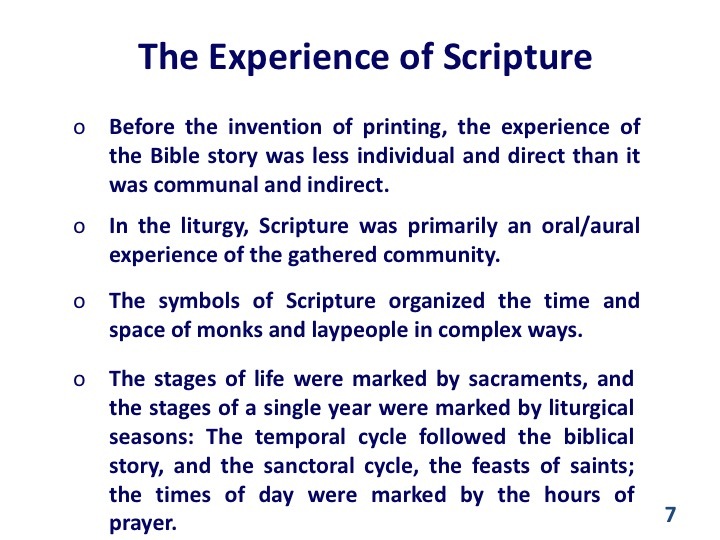 In the liturgy, Scripture was primarily an oral/aural experience of the gathered community. The symbols of Scripture organized the time and space of monks and laypeople in complex ways. 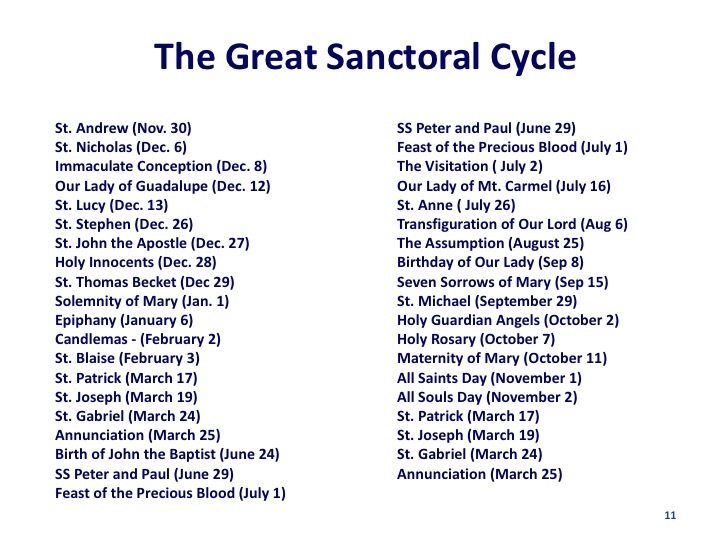 The stages of life were marked by sacraments, and the stages of a single year were marked by liturgical seasons: The temporal cycle followed the biblical story, and the sanctoral cycle, the feasts of saints; the times of day were marked by the hours of prayer. The stages of life were marked by the sacraments. 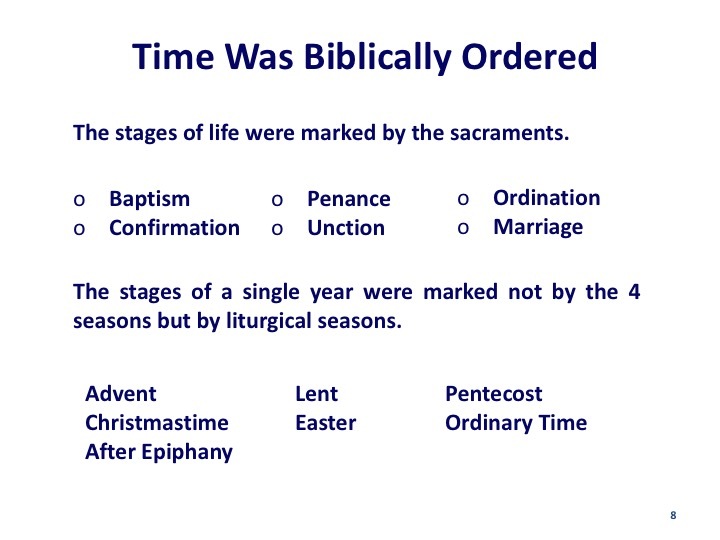 The stages of a single year were marked not by the 4 seasons but by liturgical seasons. o Jan 14 until vigil of Septuagesima. o 40 days from Ash Wednesday to the Saturday before Easter. 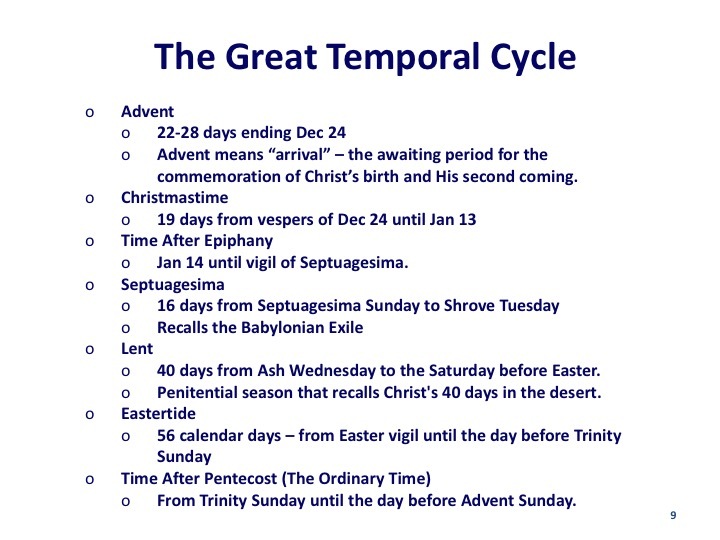 o Penitential season that recalls Christ's 40 days in the desert. o From Trinity Sunday until the day before Advent Sunday. 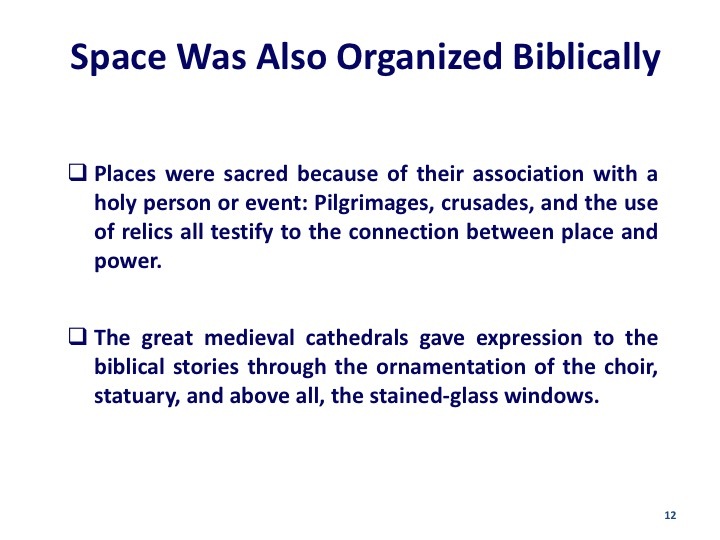 The great medieval cathedrals gave expression to the biblical stories through the ornamentation of the choir, statuary, and above all, the stained-glass windows. If you like magnificent cathedrals Europe is the place to visit. Every city, large and small, tends to have these medieval works of art. Top left - the Frauenkirch in Munich, Germany. The twin towers stand out on the skyline because it has been against the law for centuries to build anything near it more than one story high. Top right - the York Minster, in the city of York, England. Spectacular inside. Bottom left - Wells Cathedral in Wells, southern England. 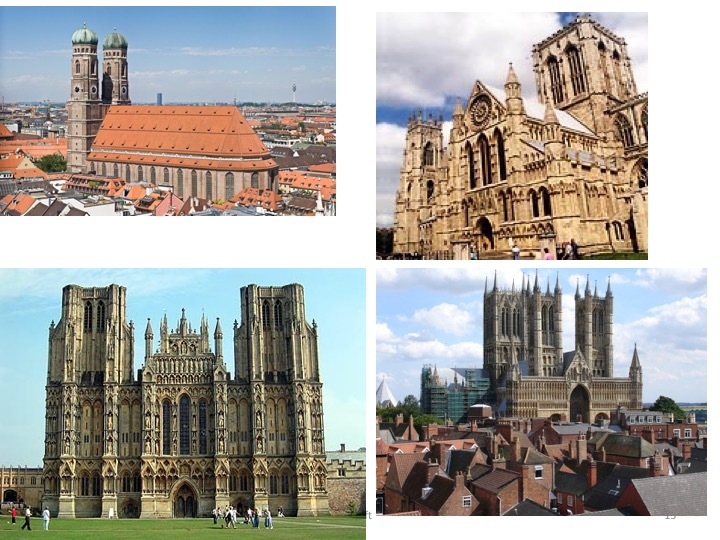 Bottom right - Lincoln Cathedral in England. Stained Glass - the Poor Man's Bible. These windows were used to tell Bible stories. Large groups of illiterate peasants would be led into the cathedrals by priests who would then point at a piece of the artwork and use it to tell a biblical story. 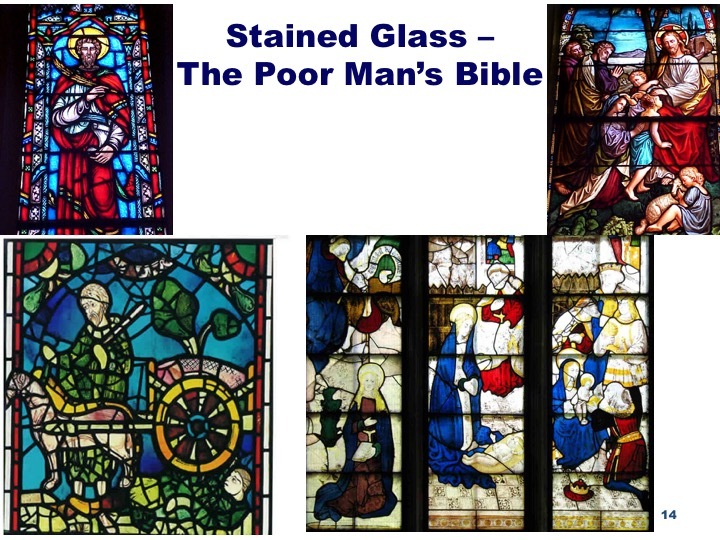 Stained glass windows became known as the "Poor Man's Bible". 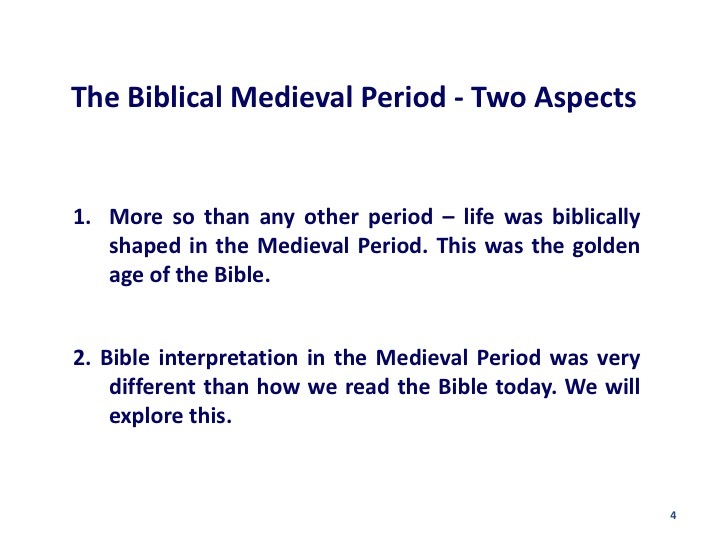 OK - Let us now move onto the second aspect of the Bible in the Medieval Period - how the interpretation of the Bible changed. Literacy among the upper classes begin to grow. The more direct and individual experience of "reading the Bible" was available to those who were literate and whose work required them to engage the biblical text (almost exclusively the Latin of the Vulgate). 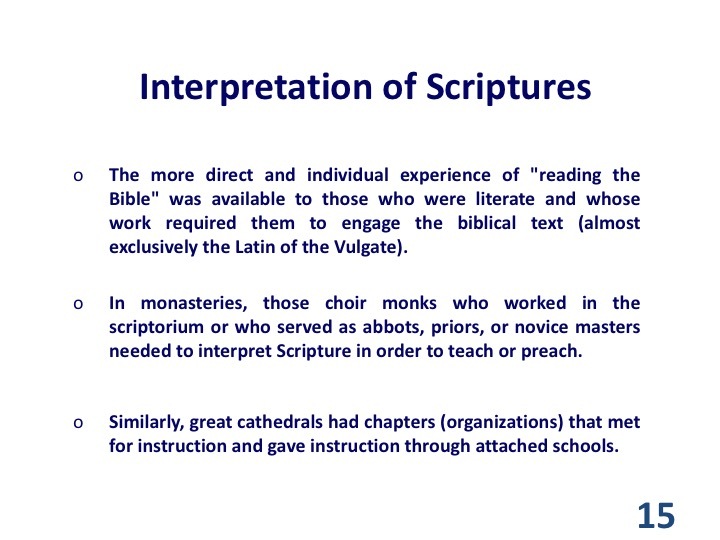 In monasteries, those choir monks who worked in the scriptorium or who served as abbots, priors, or novice masters needed to interpret Scripture in order to teach or preach. Similarly, great cathedrals had chapters (organizations) that met for instruction and gave instruction through attached schools. All of this added to literacy. The medieval universities (Bologna, Paris, Oxford) that arose in the 12th and 13th centuries represented a more professional and "scientific" study of Scripture. 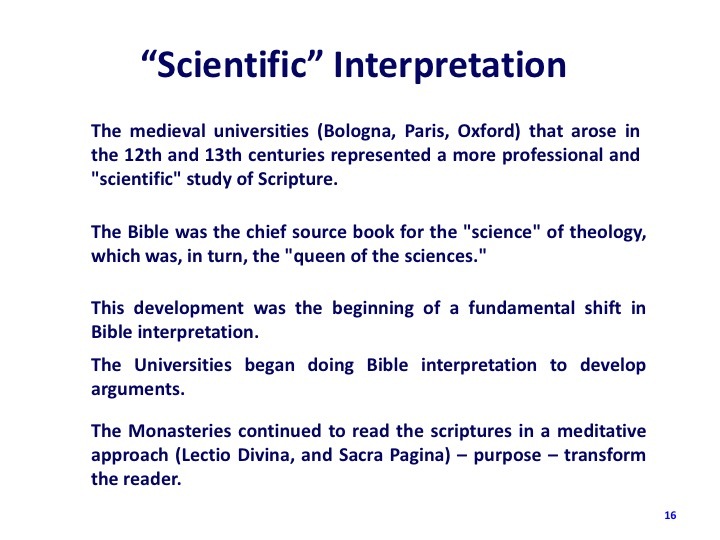 The Bible was the chief source book for the "science" of theology, which was, in turn, the "queen of the sciences." This development was the beginning of a fundamental shift in Bible interpretation. The Universities began doing Bible interpretation to develop arguments. The Monasteries continued to read the scriptures in a meditative approach (Lectio Divina, and Sacra Pagina) – purpose – transform the reader. 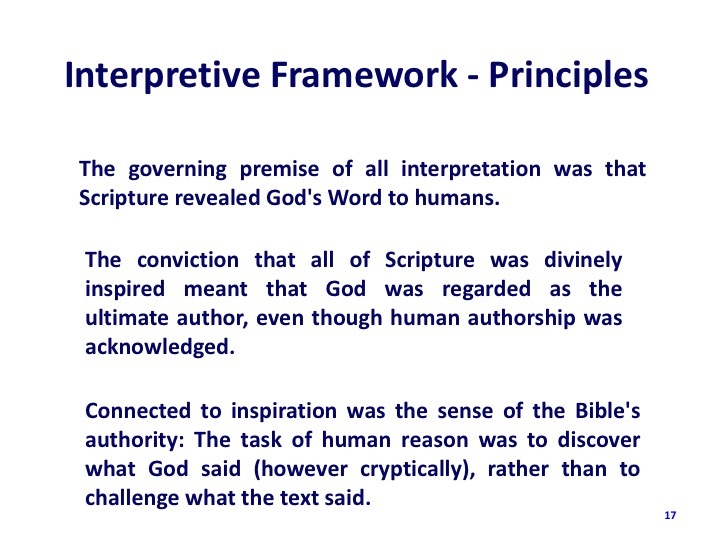 The governing premise of all interpretation was that Scripture revealed God's Word to humans. The conviction that all of Scripture was divinely inspired meant that God was regarded as the ultimate author, even though human authorship was acknowledged. Connected to inspiration was the sense of the Bible's authority: The task of human reason was to discover what God said (however cryptically), rather than to challenge what the text said. Given that God was the author of all of Scripture, then the Bible must speak in a unified and harmonious fashion. The Old Testament and New Testament told a single story, which was also the story of the Bible's readers. The Old Testament found its meaning through the "fulfillment of prophecy" in the story of Jesus and the Church. 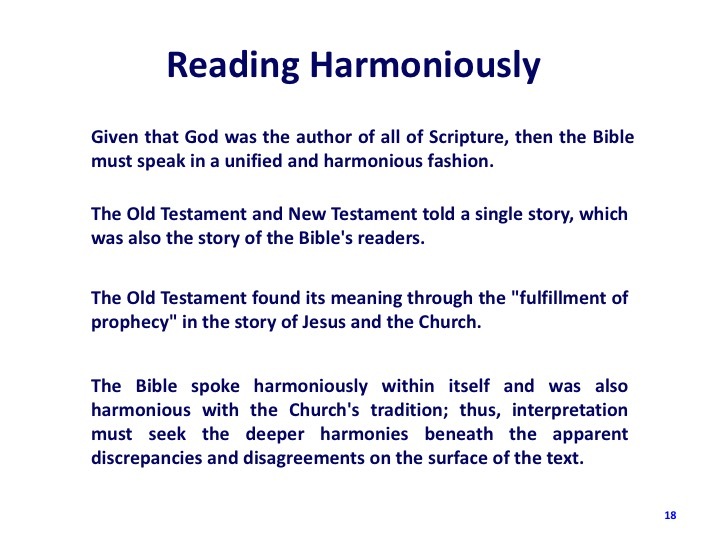 The Bible spoke harmoniously within itself and was also harmonious with the Church's tradition; thus, interpretation must seek the deeper harmonies beneath the apparent discrepancies and disagreements on the surface of the text. 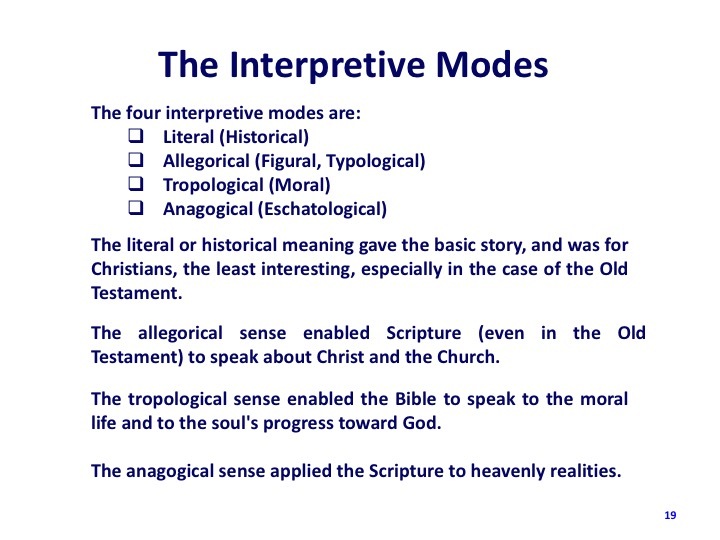 The literal or historical meaning gave the basic story, and was for Christians, the least interesting, especially in the case of the Old Testament. The allegorical sense enabled Scripture (even in the Old Testament) to speak about Christ and the Church. The tropological sense enabled the Bible to speak to the moral life and to the soul's progress toward God. The anagogical sense applied the Scripture to heavenly realities. 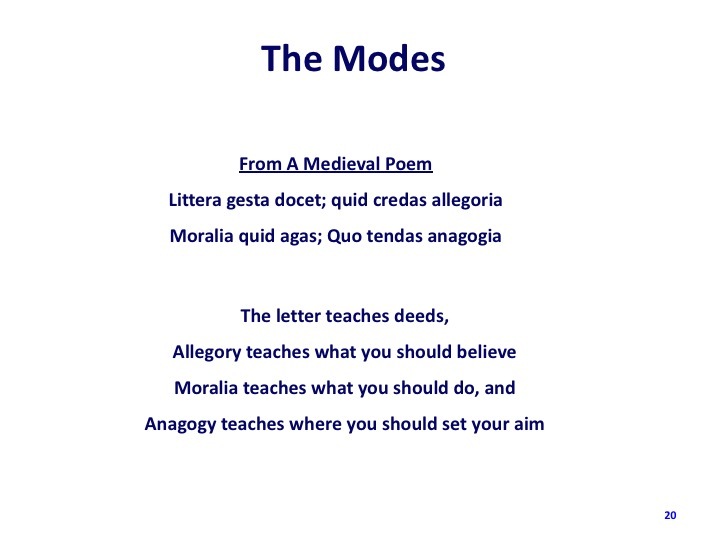 This medieval poem is a chance to try out your high school Latin. 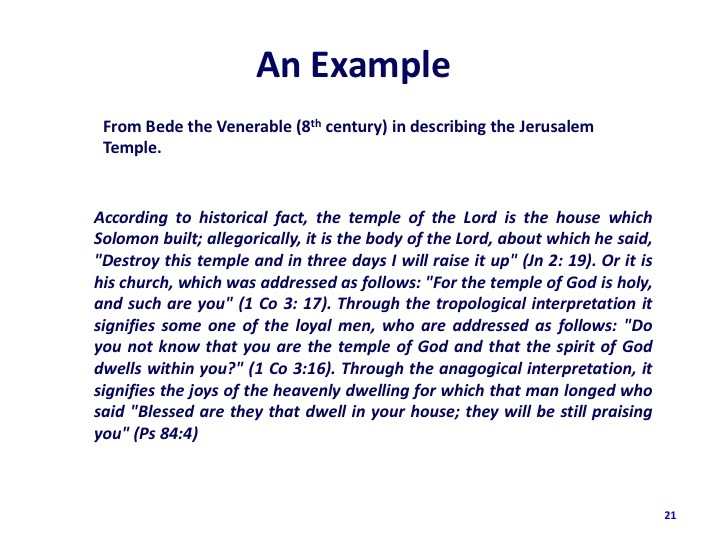 From Bede the Venerable (8th century) in describing the Jerusalem Temple. 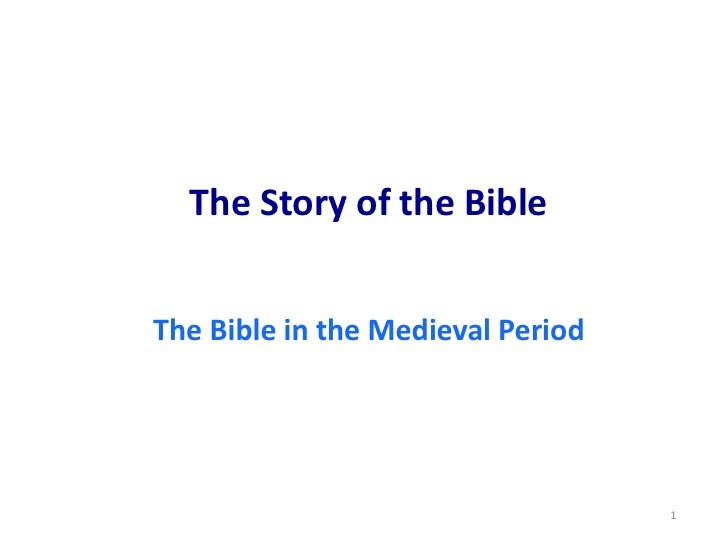 This mode of interpretation became widespread during the Medieval Period – and was widely used to explain the Bible and to justify church practices. 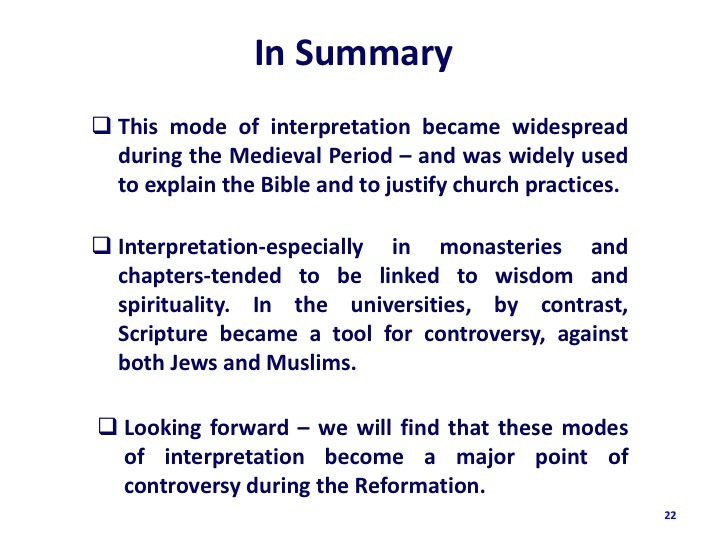 Interpretation-especially in monasteries and chapters-tended to be linked to wisdom and spirituality. In the universities, by contrast, Scripture became a tool for controversy, against both Jews and Muslims. Looking forward – we will find that these modes of interpretation become a major point of controversy during the Reformation. 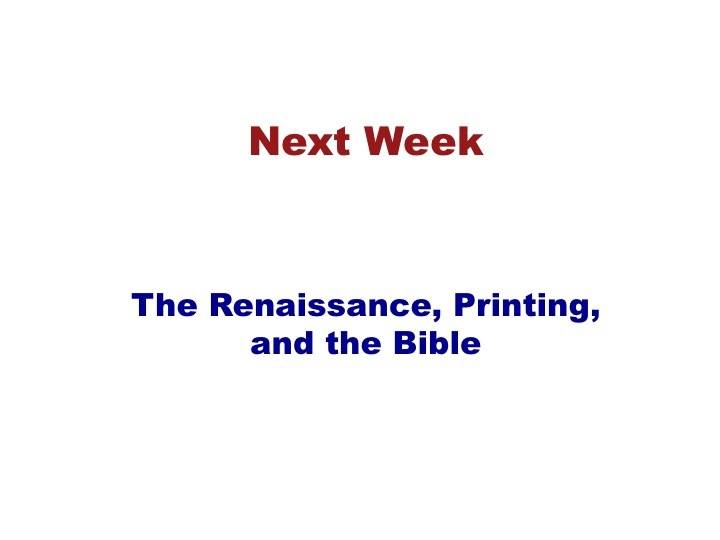 And next week we will learn how two other pivotable events changed almost everything about the Bible and Bible interpretation. One is a new mode of thinking about the past and the other is one of the most important inventions in history. We are talking about the Renaissance and the printing press.